Jimmy BaptisteJimmy Baptiste is an artist, graphic designer, curator and youth educator born and raised in Montréal. His work is influenced by the pace, beauty and eccentricity of urban city centres. As a young boy, Jimmy would take summer trips to Brooklyn, New York. It was here that he developed his love for graffiti art and murals that enliven urban landscapes. 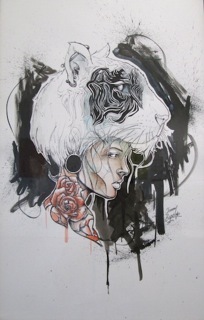 Jimmy's work takes inspiration from the beautifully exaggerated world of tattoos, anime and comic books. His knowledge of art history and popular culture have helped him in the creation of his inimitable artistic style.